Evernote, the ‘memory enhancement’ service that allows one to capture, organize, and find information across multiple devices and platforms, is gaining new users at a fast clip. As you can tell from the graph above, the Mountain View startup needed 446 days to get its first million users, 222 days to get to its second million, and 134 days to get to its third. 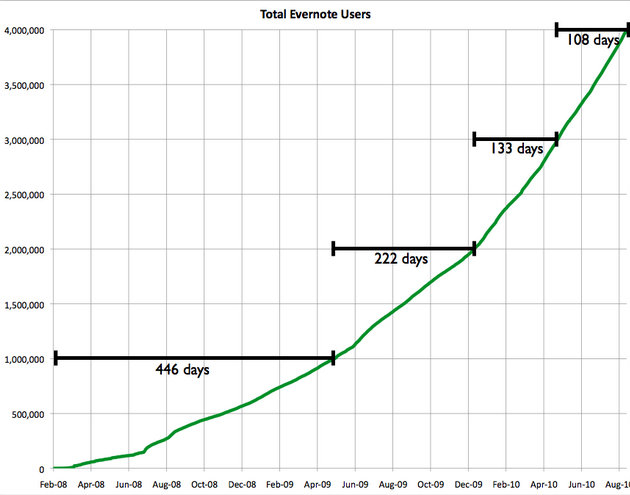 But it only took Evernote another 108 days to reach the 4 million users milestone, the company is set to announce later today. Chief executive Phil Libin tells me the large majority of its user base is located in the United States, but not overwhelmingly so: about 57%, followed by 18% who hail from Japan, where the startup now boasts an office. A decent number of users comes from Spain, UK and Germany, and more than 12% of its users are located in the ‘rest of the world’. Surprisingly, nearly 100% of all new users are attracted organically through blogs and word-of-mouth, Libin adds, which is always a powerful – and cheap – way to grow. Retention rates are on the high side, too, with approximately 70% of users remaining active after first usage. 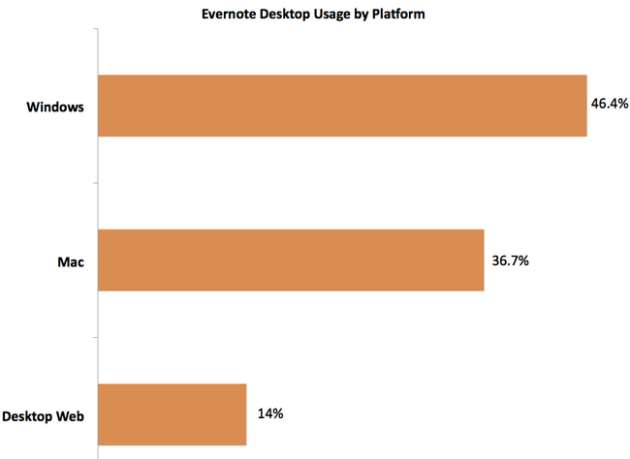 Evernote hopes to attract more users through hardware bundles (i.e. in partnership with Sony, Samsung and others) in the future. More than 10% of its user base – roughly 424,000 to be more precise – paid a visit to Evernote’s Trunk since its launch a month ago, Libin says. The Trunk is essentially a showcase of Evernote-enabled applications and hardware devices. Also important: close to 100,000 Evernote users have already gone premium so far, paying the startup $5 per month or $45 per year for bigger upload capacity, support for more file types, enhanced security and other features. 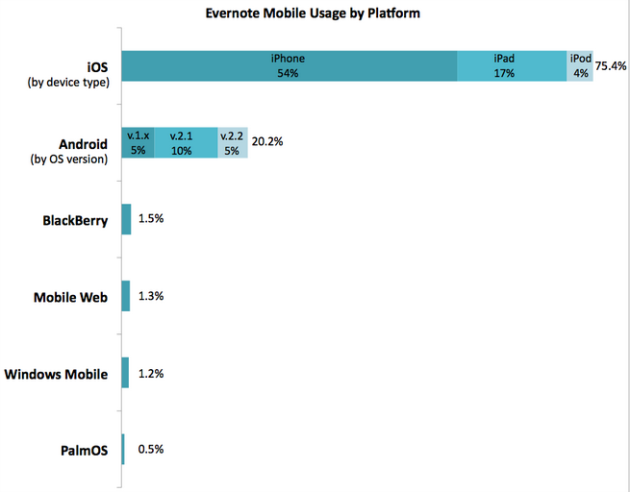 As you can tell from the graph below, Apple devices are clearly the most popular means of accessing the Evernote service, with the iOS platform coming in it about 75% of total usage. The Android platform comes in second with just over 20%, while the other platforms and the mobile website are very small compared to iOS and Android. Perhaps surprisingly, Windows remains the most popular platform on the desktop in terms of usage, accounting for nearly half of all usage compared to 36% on Mac. How long till the company climbs to 5 million users? My guess is they’ll reach that milestone in less than 108 days.